Before playing this game, a player can choose to, make a side bet worth a dollar. This allows them to take part of the payouts that are added. Once the wagered has been done, the dealer and player are given 2 cards. The idea is to get the closest value to 21. The player's value should go closer to 21 than the dealer's. The value of the cards is similar to regular blackjack. 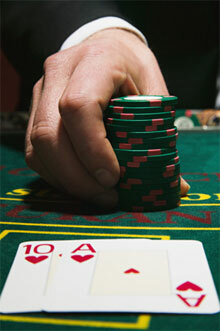 If the player has a card value that is 21 or closer to 21 than the dealer's, the player wins. The same goes if the dealer has the same conditions. If the hands are equal, then it is considered a push. However, if the player goes 22, he is a bust even if the dealer is a bust. 8 decks with 52 cards each are used for the game in Intercasino. Every game, the deck is shuffled back. The players will click on the bet field whatever bet they want to give on the table. The player can also make specifications that the bet is not equal to the present denomination of the chip and to do that, you click a unique denomination. You can also go and withdraw your wager very fast with a single click from your mouse. The total bet will appear just below on the user icon. If you want to repeat your last bet, you can use shortcuts. You can also easily set a limit at the minimum. If you want some bonuses, you have to place a dollar for the bonus bet before playing your hand while the lights are still flashing. If you were dealt aces consecutively on the first deal, then you get a bonus. Every time the bet increases, the jackpot increases. You can see the jackpot status on the left or right side of the screen.